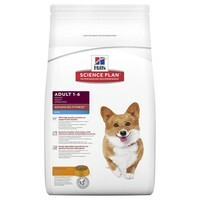 Hills Science Plan Advanced Fitness Mini Adult Dog Food (Chicken) has been formulated to support lean muscle and healthy vital organs in smaller breed dogs. The food is also suitable for dogs that prefer a smaller kibble and contains clinically proven antioxidants, lean proteins and omega 3 fatty acids to provide them with all of their nutritional requirements. Maize, Wheat, Chicken (27%) And Turkey Meal,Animal Fat, Maize Gluten Meal, Digest, Soybean Oil, Minerals, Dried Beet Pulp,Flaxseed, Vitamins, Trace Elements, Taurine And Beta-Carotene. Naturally Preserved With Mixed Tocopherols And Citric Acid.